We spent over 37 hours researching and testing 20 different types of coolers and found that size, performance, and weight were most important. The Coleman Steel Cooler provides campers and tailgaters with plenty of room for their cold drinks and food while out in the wilderness. The rustproof and leak resistant channel drain allows the cooler to be drained without having to lift it up at all. The steel handles with comfortable rubber grips and the solid steel latch will keep your content safe and secure. You can store up to 85 cans in this convenient cooler. It is very easy to clean and will last a long time if taken care of properly. If you normally engage in a lot of outdoor activities, chances are you will need a good cooler or two for these excursions. Coolers are the best way to keep food and drinks cool and safe from spoiling. There are coolers on the market that can keep food and drink cool for as long as 5 days at a time which is perfect for longer camping trips. Choosing the right cooler is nothing to take lightly. Many people have just haphazardly purchased a cooler, only to regret the decision when it didn’t have enough room or perform the way they hoped it would. There are several things you want to look at and check out before you make a purchase. Coleman is a well known and long trusted name in camping equipment. This attractive and functional Coleman Steel Cooler is perfect for camping trips, backyard cookouts and other get togethers. Features include steel handles with rubber grips and a solid steel latch to keep the cooler’s contents secure. This sleek and stylish cooler has a rustproof and leak resistant channel drain that allows users to drain the cooler without having to tilt it. This cooler measures 25 ½” x 17.6” x 17.4”. It is designed to hold as many as 85 cans with ease. It is very easy to clean and will last a long time with proper use. 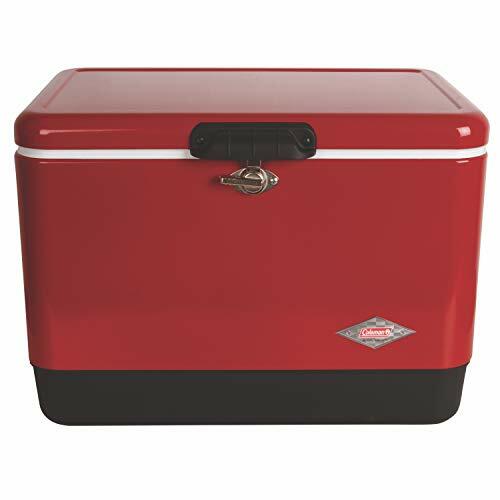 The red and black color of the cooler is very flashy and looks great sitting next to your campsite or barbecue grill at home. Igloo is a well known name in coolers that consumers know and trust. This cooler will keep items inside cold for up to 5 days even if the temperature outside is 90 degrees. The technology behind this extensive cooling ability is the Ultratherm insulated body and the UV inhibitors in the lid that guard against any damage by the sun. The reinforced handles are strong and durable and can handle rough use. The threaded plug can be hooked up to a hose for easy draining. The snap-close lid and tie down loops keep the contents inside safe and secure. It can even be a great seat around the campsite or at the backyard barbecue. This monster cooler holds up to 188 cans for plenty of drinks for your gatherings. The measurements of the Igloo Polar Cooler are 38.31” x 17.38” x 17.75”. 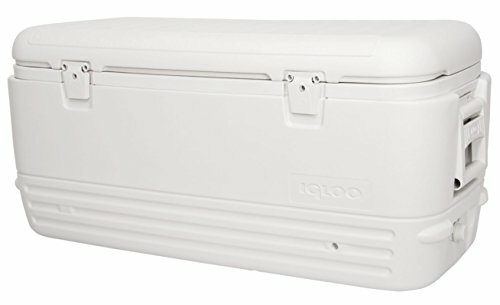 If you are looking for a powerhouse cooler that holds plenty of food and drink, the Igloo Polar will fit the bill. This heavy duty premium polyester cooler bag is heat sealed with high density foam insulation. It is made of 840D polyester which is stronger than both 600D and 420D. The top insulated part has a zippered mesh pocket and the bottom compartment is large and insulated on all sides to keep drinks cold longer. The large front zippered pocket has two smaller mesh pockets inside the cooler bag and there are two large zippered mesh pockets on the sides for drinks as well. There is an extra Peva liner for additional protection so if the liner is accidentally damaged you can replace it with the extra liner. It’s very easy to replace; just zip it up and that’s all there is to it. You should not use loose ice or open liquid in this cooler bag. Instead, use ice packs to keep everything cool. This is the perfect cooler for long shifts at work, day hikes, days at the beach or park, sitting out by the pool, road trips and much more. It has a lifetime warranty against manufacturer defects or problems. If you work at a factory, working long shifts, this is the perfect cooler to store your lunch and snacks in for the long day ahead. It is also terrific for truckers and can fit right in the seat next to you. This soft-sided cooler bag, with dual insulation, measures 15” x 9” x 12”. The compartment height is 8” high and the bottom compartment is 4”. There is plenty of room for food and accessories and is easy to clean in case something gets spilled on it. Carrying is easy with the padded, adjustable shoulder straps that are removable and the two long handles for carrying like a suitcase. Coolers are used every day for numerous tasks. Keeping drinks cool during cookouts, keeping food and drinks safe and cold on campouts, holding food and keeping it from going bad in the event of a power outage and other uses as well. There are a large number of coolers on the market. The three top rated coolers that we have featured above are all excellent coolers to store your drinks in so they stay cold even in hot weather. Each of the cooler choices that are reviewed provides a different type of cooling ability and capacity. The steel Coleman and huge plastic Igloo are excellent for camping trips and cookouts. 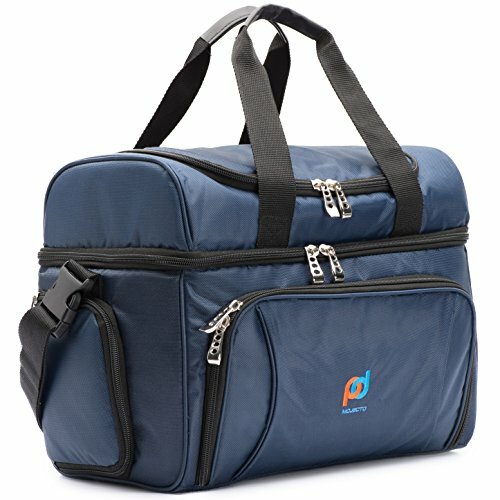 The soft cooler bag makes a great on the go cooler for car trips and for keeping food and drinks cold during work hours. If none of these are quite what you’re looking for, read our buyer’s guide below for more information on how to choose the right cooler for your needs and activities. Having the right information and knowing what to look for will help you make a confident decision that you will benefit from and be happy with. There are many different types of coolers available to choose from and the choices get larger every day. We have outlined the most common types of coolers below so you can understand what the differences are. Coolers have so many different capabilities, such as being able to be plugged into an outlet or car lighter socket, and having heavy duty insulation to keep food and drinks cold for days. They can be made from many different materials and come in all different sizes. Plastic – Another popular name for plastic coolers is ice chest. They are made from very tough, durable and molded plastic. They are very strong, long lasting and come in all kinds of sizes. Plastic coolers have insulated lids and tough plastic handles for carrying. Some have long handles and wheels for making toting them around even easier. The plastic coolers can handle loose ice cubes in it with no problem. The best way to fill a plastic cooler is to put the drinks and/or food inside the cooler first and then dumping bags of ice in around it. Most plastic coolers have drain holes of some kind to get rid of melted ice. Fabric – Fabric coolers are also called insulated cooler bags or collapsible coolers. They are designed for carrying fewer items than plastic coolers and are often used as lunch coolers for men that work on construction sites, in factories or who drive trucks. Fabric coolers are very lightweight and are made from canvas or nylon material. They are insulated with a foam layer. When they are not in use, they are easy to flatten and store away. They are not as durable or strong as plastic coolers, but there is definitely need and use for them for day trips and other lighter duty cooling jobs. Metal – A metal cooler is going to be the strongest and most durable of all the coolers on the market. They are often used by hunters and fishermen who usually need a very sturdy and durable cooler. The insulation layers are covered and protected by metal and they work to keep the food and drinks that are in the cooler cold for long periods of time. Metal coolers are more expensive and heavier than other types of coolers but they do tend to last a lot longer than others too. Styrofoam – This type of cooler is typically regarded as a temporary cooler. They are extremely lightweight and can break very easily. They are good for storing super lightweight items. Styrofoam coolers are very inexpensive but will have to be replaced often and are not good choices for camping and other outdoor excursions. Electric Cooler – A car cooler is also called a portable car fridge. They are insulated cooler boxes that can be plugged into a car cigarette lighter outlet. It is a very convenient way to keep your food cold while on a long drive. It works the same way a regular refrigerator works and keeps the interior of the box cold so the food and drinks stay cold as well. These are usually very expensive but some people like them because they are more convenient than plastic coolers since you won’t have to worry about getting ice and draining water from the cooler. You want to think about how you will be using your cooler before you purchase one. What you will be doing with it, what you will put in it and how often you will be using it will all play a part in choosing the right cooler for your needs. You want to choose the cooler that best suits the jobs you have for it. Before making that final decision and purchasing a cooler, really have a solid idea of what you need. Cooler Size – There are many different sizes of coolers on the market. You can choose from a collapsible can cooler to a huge 100 quart plastic cooler. How much will you be storing in the cooler? Will you be using it for large gatherings and campouts or do you need something that keeps food and drink cold for just a couple of people? Remember to account for ice packs and ice cubes when you are choosing a cooler size to purchase. Figure on about 25% of the cooler being taken up by ice or ice packs. Cooler Durability – You want to choose a cooler that can handle the amount of use and food and drink that it will need to hold. If you only use the cooler occasionally, you will not need to worry as much about durability as you will if you will be using the cooler every weekend. The more durable the cooler is that you choose, the more expensive you can expect it to be. The good news is that it will last a really long time so it becomes more of an investment. You want to look for features like waterproof, strong, durable handles, tight fitting lids and if it is wheeled, you want the wheels to be strong, large and sturdy so the cooler can be maneuvered over rougher terrain if necessary. If you’re purchasing a fabric cooler, look for durable, long lasting synthetic materials and a strong carrying strap that is at least double stitched. Cooler Practicality – You want the cooler you purchase to be practical for what you need it for. Plastic coolers that can handle a lot of food and drink for several days will be much heavier to move. This is fine if you are doing car camping, but if you will be hiking, you will not be able to cart a large plastic cooler along the trail with you. Think about what you will be doing with the cooler and where you will be and purchase a cooler that makes sense for your activities and needs. With all of the coolers on the market today, it is guaranteed that you will be able to find one that will fit your outdoor activities and needs. It will just take a little bit of planning and research to make sure that you match the cooler you purchase with what you need it for. We’ve done some of the research work for you by providing the reviews of the top rated coolers above, any of which are excellent, good quality products, well worth considering. We’ve also provided additional information that will help you sort through the available types of coolers and decide which one you want. The right information arms you with the knowledge you need to make confident decisions that you will be happy with because the choice will meet your needs. We want to make the process of choosing the right cooler easier so you can just enjoy the outdoors and your new cooler too.